Friday, I asked Stacie what she wanted for dinner that night. 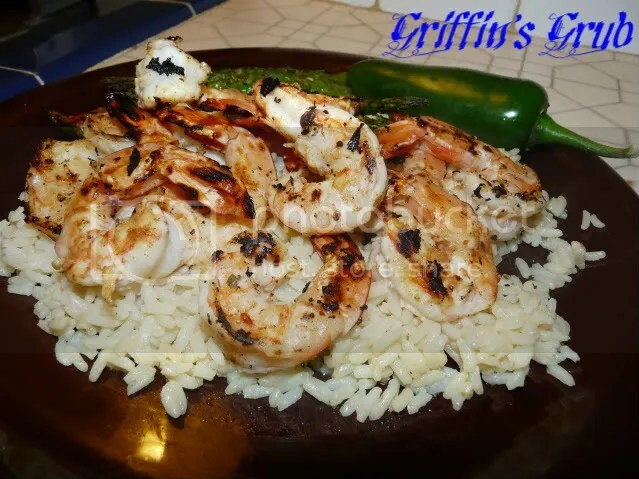 She suggested shrimp, since she was in the mood for something healthy and something that wouldn’t take too long to prepare and grill as we had a lot of packing and cleaning to do so we will be ready for our move. On the way home from work, I stopped and picked up about a pound of 16-20 sized shrimp and some asparagus to go along with it. 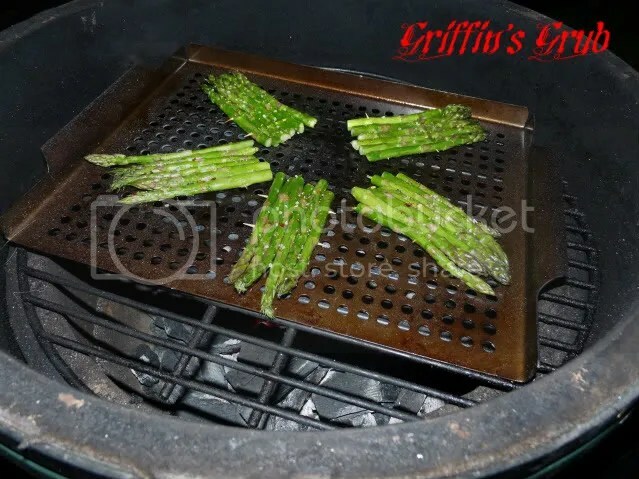 I haven’t used this technique in a while because it’s an extra step in the prep process and usually I use some kind of grill pan, but tonight I decided to make asparagus rafts. All it involves is “spearing” your asparagus with two toothpicks. 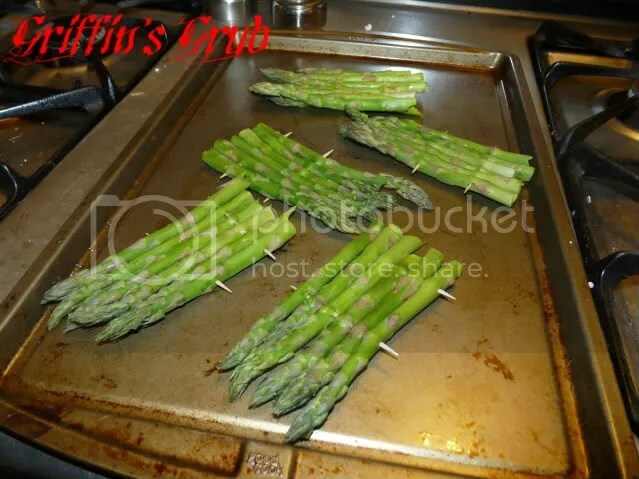 This allows you to more easily flip your asparagus as you grill them and prevents you from losing any between the grate. I find the best way to accomplish this is to lay them horizontally side by side and insert the tooth pick through the asparagus parallel to your counter. Not to hard, just take your time and try not to break your asparagus. I seasoned them up with some canola oil, sea salt, fresh cracked pepper and some red pepper flakes and threw them on to a preheated grill pan on the Egg at 350 F.
As the asparagus takes longer to cook than shrimp, they went on first. 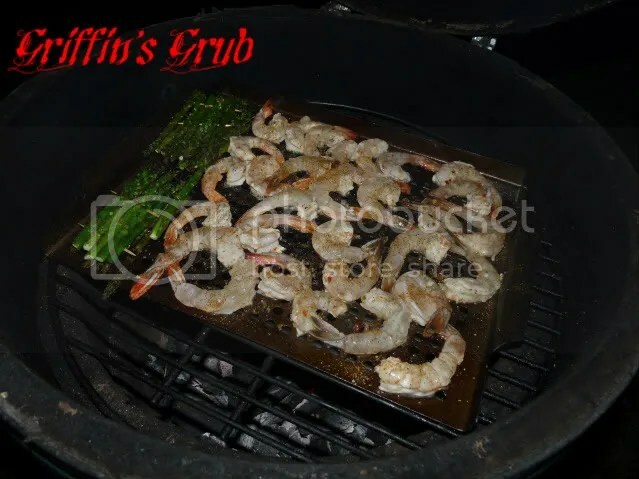 Meanwhile, the shrimp had been taking a swim in some Italian dressing, onion and garlic powder and a bit of Dizzy Pig’s Swamp Venom (told you we love this stuff). I took them out of their pool, applied more Swamp Venom to give them a nice bit of heat and then they joined the asparagus on the Egg. Make sure that when you throw the shrimp on, that you aren’t going to have any distractions. 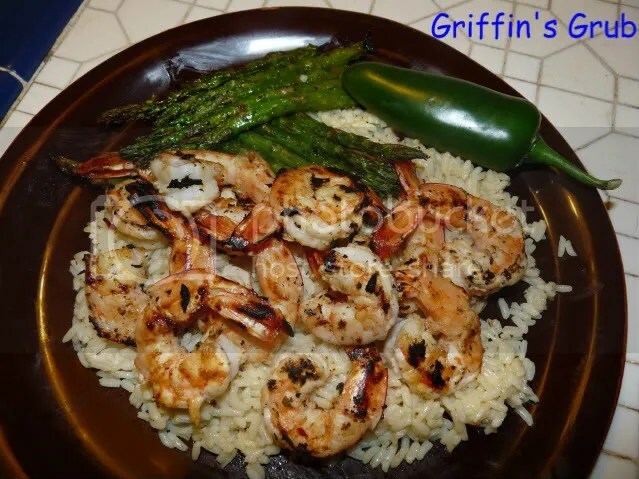 Shrimp cooks fast and quickly goes from a succulent treat to rubbery nastiness, so keep a close eye on them. When they begin to firm up and turn pink they are done. While I was outside getting the Egg ready to go, Stacie had started some rice to go along with it, but instead of using the called for amount of water, she substituted fat-free, low sodium chicken broth. I’ve heard of that trick on Food Network before, but had never tried it. Let me tell you, it really does transform your ordinary, boring rice into a tasty side dish. I served this all up with some home made cocktail sauce, no jarred stuff for us. This was a very easy to prepare and healthy dinner, and although we didn’t get a lot of packing or cleaning done, we were able to sit down and enjoy a movie together. Looks like a great meal Griffin. I also have to agree with the usage of broth in place of water–for many recipies. Great stuff right there. Very nicely done! I like to use broth in place of water whenever possible too. Really adds some flavor. Another of my favorites is to use beer as a cooking liquid. Love the asparagus rafts. I’ll have to give that a try next time. 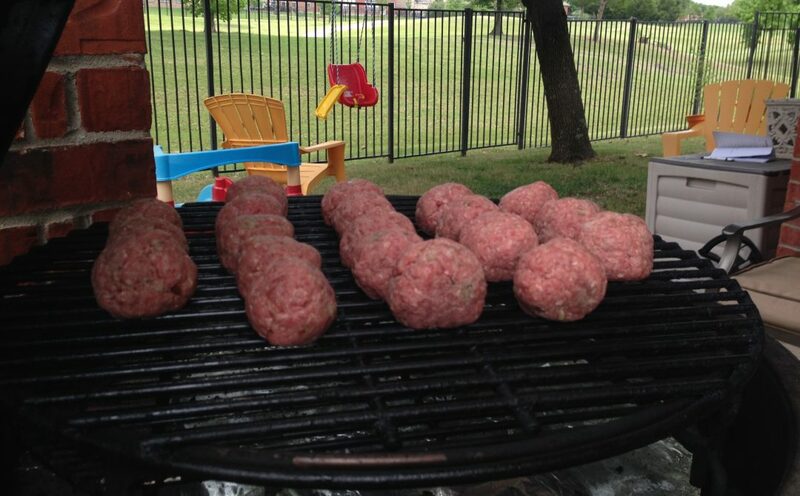 It would sure save on losing some to the grill gods, and make it easier to paint with some balsamic vinegar too. Win win.